Animal Feed « Global Market Insights, Inc.
With unprecedented technological and chemical advancements in the last few decades, the iron phosphate market has captivated a slew of industry verticals including agriculture, manufacturing and consumer goods. Iron Phosphate (FePO4) is an extremely useful inorganic compound that can be functional in organic farming as a pesticide ingredient, in children’s food as a nutrition fortifying component and as an additive in other food or beverage product. 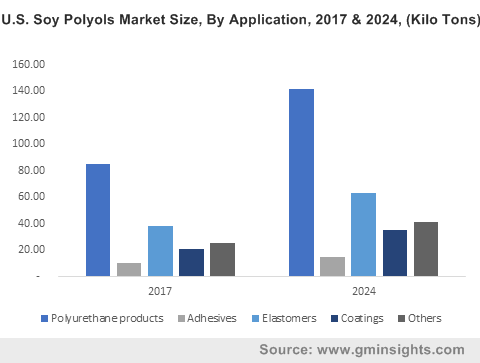 Extensive research and development activity instigated by pharmaceutical giants has shaped a critical customer base for the FePO4 compound, bolstering the global iron phosphate market. Earning an impressive USD 520 million in 2017, the remuneration contributed from applications in agricultural and health sectors can be ascribed to the rising population, which is certainly invigorating the iron phosphate industry. It is estimated that world population has surpassed 7.6 billion in 2018 and is straining the agro-based industries, which toil to meet the extraordinary demand for food and other consumables. The increasing need for boosting the agricultural produce has coerced efforts for the improvement of arable land and protecting fields against harmful organisms, imposing the necessity of the iron phosphate market in fertilizer and pesticide sectors. Further in the food segment, higher disposable income has led to a surge in expenditure on powdered drinks, dietary supplements and cereals which are enriched with the addition of FePO4. Fortification using FePO4 is quite beneficial for supplying nourishment to people suffering from iron loss or iron deficiency occurring from continuing external blood loss or when daily food intake does not satisfy the body requirements. Subsequently, progression of the iron phosphate industry can be observed due to augmented utilization of FePO4 in iron supplements given to anemia patients for preventing any further losses of red blood cells. 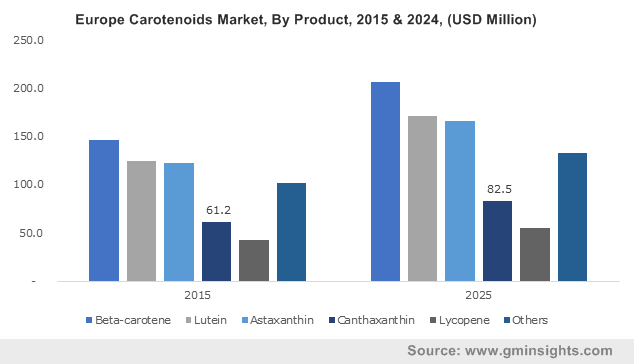 As the healthcare industry is attempting to cope with increasing prevalence of diseases caused by nutritional deficiency as well as other chronic disorders, the iron phosphate market can be expected to undergo a tremendous transformation. Stating the evolution of the iron phosphate industry, a large number of pharmaceutical companies are coming up with ways to infuse FePO4 in treatments for lowering fibroblast growth factor 23 (FGF23), which is an important biomarker of chronic kidney disease. An oral iron-based phosphate binder, Ferric citrate was recently found to reduce FGF23 levels in non-dialysis dependent chronic kidney disease (NDD-CKD) patients and also in people suffering from iron deficiency anemia. A potent oral solution for iron deficiency anemia in patients suffering from NDD-CKD, which is also capable of lowering FGF23, will be vital in managing the disease and is indicative of the massive potential of the iron phosphate market. In terms of manufacturing processes, pretreatment for coating and painting forms an integral part of iron phosphate industry’s application gamut. FePO4 coating has been in practice for more than 50 years, as it provides a better paint adhesion and reduces the rusting of a metal. Generally, iron phosphate coating solutions have a low initial investment cost and are preferred in conversion coating of most indoor equipment that are not exposed to high risk of corrosion. They are also vastly utilized for base coating of a surface before painting in residences to improve the longevity of the paint. 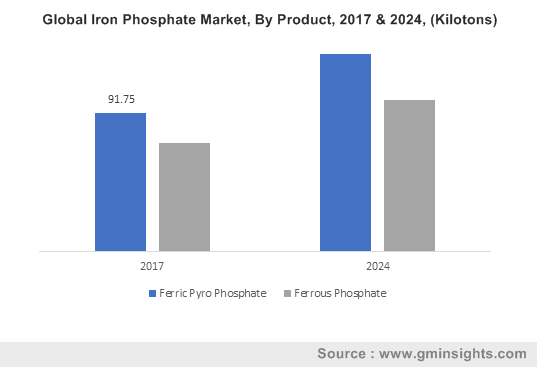 The use of FePO4 in crucial stages of iron and steel production and the rapid expansion of residential construction taking place across the world will further propel the iron phosphate market. The future prospects of the iron phosphate industry cannot be completely described without the mention of its relevance in the electric automobile industry. An exceedingly trending area of product development is the lithium-ion battery, which are critical in the operations of an electric car and majority of consumer devices. Lately, lithium-iron phosphate (LiFePO4) batteries are being produced which show better characteristics than the those made with metal oxides. Soon they will be adopted commonly is electric vehicles and many companies in the iron phosphate market are scuttling to develop low-cost, long-lasting and highly efficient LiFePO4 batteries. A report was released by UBS predicting that by 2025, the worldwide sales of electric vehicles will reach 16.5 million and approximately every sixth car sold will be an electric one, demonstrating a prolific revenue stream for the iron phosphate market. The lithium-iron phosphate batteries also have a wide range of benefits in grid stabilization, lasers, power tools also in aviation. 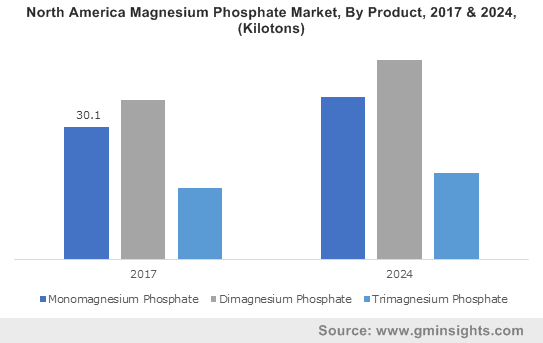 All in all, the iron phosphate market is collectively enhanced by a multitude of segments and is projected to witness a growth rate of more than 5% from 2018 to 2024. Exhibiting a fragmented and competitive nature, the industry is comprised of local and international suppliers like Merck, Jost Chemical Co., Imperial Chem Corporation, Crest Industrial Chemicals and Hefei Asialon Chemical Co. Ltd. This entry was posted in Bulk & Specialty Chemicals and tagged Active Ingredient, Animal Feed, Bakery, Dairy, Excipients, Ferric Pyro Phosphate, Ferrous Phosphate, Fertilizers, Food & Beverage, Iron Phosphate Market, Iron Phosphate Market Share, Iron Phosphate Market Size, Nutritional Supplement, Paint & Coating, Pharma, Steel Manufacturing.